POP Montreal International Music Festival kicked off this past Wednesday for its 13th edition. Bringing in big names like Against Me!, Sheryl Crow, and Ronnie Spector, the festival also boasted an impressive array of lesser known acts and local talent. For the Sept.18 Thursday night slot, some friends and I decided to check out Montreal based garage-rock quartet, Ought, playing at the iconic Rialto Theatre. Heading down to the Piccolo showroom in the theatre’s basement, you got the sense that the space was unfinished, likely because the theatre has been undergoing renovations for the last little while. Old movie posters adorned the bar area while the main room was sparsely decorated with nothing but a few tables bordering most of the walls. The stage was a slightly elevated platform against a brick wall, giving the room a grungy, yet endearing quality, much like the night’s headlining act themselves. Press photo courtesy of POP Montreal. At 9:30 p.m., American noise-rock veteran, Carla Bozulich, took the stage and played nearly one hour of what can only be described as something beyond the realms of experimental and alternative rock. She began her set with several minutes of guitar reverb and feedback scratching through the speakers, while the percussionist and synth board player added their own particular noise elements. With some technical glitches, Bozulich chastised her guitar, yelling “FUCKER,” adding that she was trying out a new technique, and promised it would sound really good once she got it to work properly. Meanwhile, the keyboardist took advantage of the brief pause to take a bite out of the red apple he had been snacking on earlier in the evening. Break over, the trio got right back to their set characterized mainly by a slew of slow and sludgy guitar playing, with percussion and synth to match, cutting quite nicely to fast and chaotic strumming. Towards the end of her 50 minute set, Bozulich introduced a “special guest”; a man dressed head to toe in black who begun to play what appeared to be some kind of variation of a flute alongside the other musicians on stage. The percussionist grabbed the saw that was by her drums the entire time, and began to play with it. Playing with the tool emitted a sound that was sweet and subdued; a nice contrast to her high energy drum playing. The crowd was immersed in darkness, with only a red light splashed against those on stage and the brick wall behind it. The atmosphere was spooky and borderline occult; the combination of slow, ethereal instrumentation and dim lighting had my friends and I feeling like we were taking part in an occult summoning, but we were intrigued nonetheless. After performing her last song, Bozulich thanked the crowd, announced she had a few hand made t-shirts for sale, and exited the stage. Behind schedule, the growing restlessness of the packed room was soon washed away when the night’s main attraction stepped on stage. Fronted by Tim Beeler, Ought dove right into the title track from their debut LP, More Than Any Other Day. Beeler exuded showmanship, engaging with the crowd by tossing out adlib lyrics about grocery shopping and other mundane daily tasks. But there’s nothing mundane about Ought’s specific breed of post-punk, and at times, art-rock sound. The band’s arrangement (Beeler on vocals and guitar, Matt May on keys, Tim Keen on drums and Ben Stidworthy on bass), is probably the only thing traditional about these guys. Ought slowed down the pace after several high-intensity songs only to pick it directly back up in the bass heavy, Talking Heads-esque track “Habit”. With a simple purple light highlighting the guys on stage, the crowd picked up on their energy and formed a small makeshift moshpit in the middle of the room for some of the louder songs. The pit’s rambunctiousness spilled over into the rest of the crowd, with the entire room grooved and moved to the remainder of the hour long set. Humble and sweaty, the hometown boys smiled and thanked POP Montreal and the equally sweaty audience for an awesome and rowdy night, and headed out to prepare for the rest of their tour. September is in full swing and the weather has already turned from bright, sunny and warm, to grey, dark and chilly, the latter providing the perfect backdrop to Timber Timbre’s Friday night POP Montreal show at Metropolis. On tour promoting their latest album, the Polaris Music Prize short-listed Hot Dreams, Timber Timbre enlisted the help of Toronto band Tasseomancy. The sister duo provided vocals, acoustic guitar, and were backed by a keyboardist and percussionist. Dressed in Victorian style clothes, Tasseomancy’s sound was equally as eerie and mysterious as their attire. Most of the songs in their 45 minute set were consistently slow-paced and dreamy, but many of them built-up momentum, gaining speed and starry eyed admiration from the crowd just in time for the night’s headliners. Timber Timbre emerged onto the stage, blanketed in dim lighting. A purple neon sign emblazoned with the words “Hot Dreams” remained flickering above the band. Steady, rhythmic drumming followed their entrance, and they opened the set with “Grand Canyon” off their latest album. Diving headfirst into “Beat The Drum Slowly,” guitarist and frontman Taylor Kirk’s disembodied vocals seemed even more ghostly in a live setting; the reverb from his words getting under your skin and staying deep in your bones. The eerie keyboard interludes between songs sounded almost like dripping water, or something from a movie soundtrack. Pulling mostly from Hot Dreams, Timber Timbre played “Lonesome Hunter” and “Black Water,” favourites off Creep On Creepin’ On. Despite being known for their haunting and subdued folk sound, the group seemed to beam off energy on stage, more so than any studio version of their songs. Exiting the stage, the room immediately cried out for an encore. Obeying, Kirk promptly returned for several songs. Playing alone save for his electric guitar, Kirk was engulfed in murky red lighting. Several moments would pass where Kirk would pause from singing, refrain from strumming and all you could hear through the dense, dead silence was the faint static from the amplifier, spreading a chill throughout the room. The rest of the band filed back on stage for the final few encore songs. Having played mostly from their new album, Timber Timbre won favour with the crowd by ending their hour and a half set with the always sinister sounding, “Trouble Comes Knocking”, leaving us haunted, dreamy, and deeply satisfied. Ty Segall tore-up Club Soda better than any other POP Montreal show. “The show sold out in 2 days!” said an excited Ty Segall fan as he lined-up outside Club Soda, along with other music-nerd early birds, and your music editor. That’d make sense — Segall got the crowd to jostle, jump, and gel their hair with glitter on his Sept. 20 show with POP Montreal. Segall’s been going through a glitter phase — his press photos show his eyes bedazzled with glimmering rhinestones and his lips lit-up with shiny blue glowing lipstick. But before the main event that tore-up the club, Montreal-bred group The Nymphets took to the stage and played some tunes that threw back to early Pixies. They had charisma and sass, and their drummer, Johanna Heldebro, was totally badass, but their mic sound wasn’t great. They enthusiastically played their surfer punk-pop songs. The early crowd, made-up majorly of fresh-out-of-highschool young guys, ate it up. Later, La Luz lulled us into their sunny sea-side tunes with guitar riffs that could have been written by The Doors back in Venice in the 60s. The four-piece comprised only of women sang and danced to their catchy tunes while their skirts gave them a girly silhouette under the stage lights. The drummer made some particularly cool and quick drum ticks, mixed with the keys and guitars putting out fluid melodies and licks up front. Frontwoman Shana Cleveland had huge curly hair that seemed to bob to the beat. Finally, the group ended their set with a wave to the eager audience and skipped off stage. As gangly boys and girls dove from the stage and surfed on hands and heads, the band violently strummed-out the chords to more Manipulator songs, as well as old favorites. One fan enthusiastically requested that the band play the track “Girlfriend” off the album, Melted. Once the song ended, the same guy yelled “play it again!” Segall did not play it again. He did, however, start another song, stepping into the crowd while simultaneously playing guitar. His legs were supported by the people below, and in that moment, he was not unlike a blonde Jesus walking on water. His music is so good and his talent for writing rock songs so evident that he is almost like a god. It does take some special music, though, to pack Club Soda to the rims. 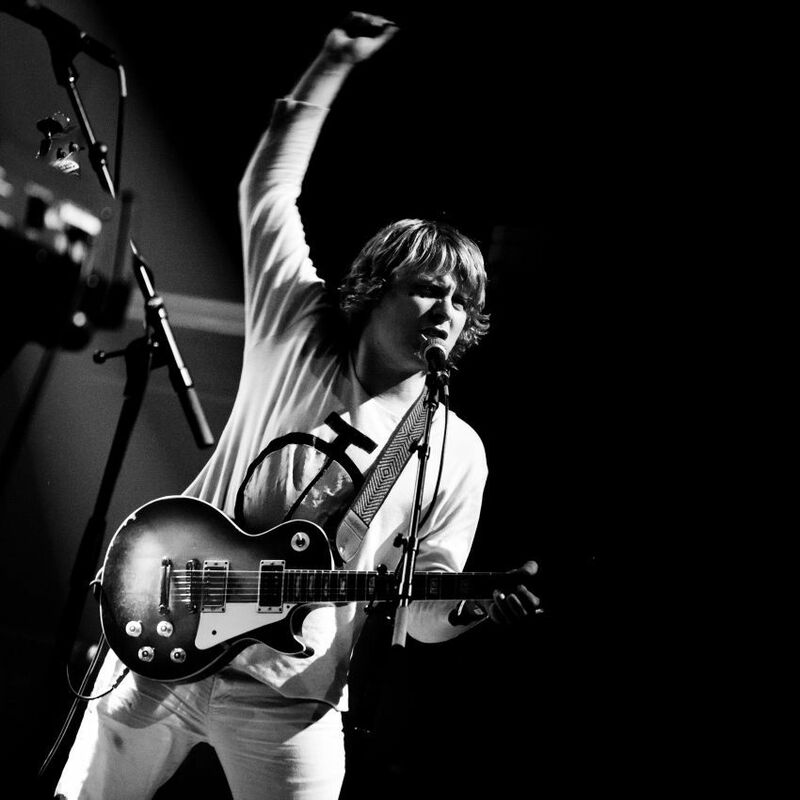 For all of those who didn’t catch Ty Segall — shame on you.